The musiXmatch lyrics player iPhone, iPod Touch, and iPad app successfully blends karaoke, Shazam, and solves the ages old question of “Was that a grunt or a word?” when listening to songs. 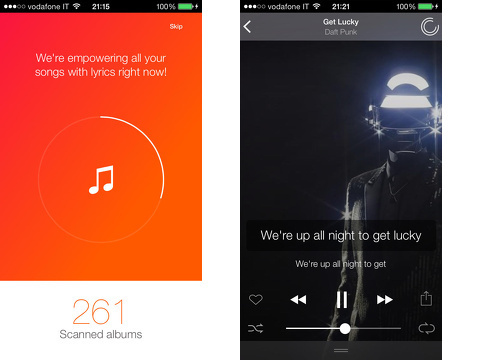 After a quick account set-up with a Facebook or Google+ authorization, the musiXmatch iPhone app scans songs saved in your iOS Music and creates a sweet, fresh interface to play your songs with the lyrics on the screen. This free download from the iTunes App Store is a fun, dynamic iOS music experience. The graphic style of the musiXmatch lyrics player iPhone app is reminiscent of Apple’s Music. The bright white screen is clean and crisp, but also punctuated with orange icons. There are two navigation bars. The top bar provides filtering options – sort by musician, song, playlist, and album title. When you touch one of the filters, the list of music changes to reflect your gesture. The bottom menu bar is similar to Instagram, as it moves you between your music feed, search, likes, profile, and MusicID. There is an ad just above the bottom navigation bar in the free version. To eliminate the ad, you must purchase a premium upgrade for $3.99 for six months or $4.99 for one year. The upgrade is inexpensive for the quality of the musiXmatch iPhone app, but the unobtrusive ad makes the free version perfectly functional. You touch a song from one of your filtered feeds to move to a cool interface. There is an album or band photo that fills the screen. In the lower portion of the screen, the lyrics scroll up on the screen from the bottom. The current line is written in larger font, and the next line is just below in smaller font. The smaller font turns into the larger font when it becomes the current line. Just below the lyrics, you can rewind, fast forward, pause, set to repeat, and set to random with a touch. You can also add to your like feed, as well as share to AirDrop, Twitter, Facebook, Instagram, Google+, and reading list. The horizontal lines at the bottom of the screen open super capabilities – you can send music and lyrics to your smart TV. One of the surprising features of the musiXmatch lyrics player iPhone app is MusicID. You access it from the home screen by pressing the icon in the middle of the bottom navigation bar. You can hold your iPhone to listen to any music playing. Once the song is identified, the musiXmatch lyrics player iPhone app immediately plays the song with the lyrics sliding on the screen. It’s super cool. An additional neat feature is the search icon to enter a manual search of lyrics and check out trending lyrics lists. For any song you identify or stumble across, you can purchase and download from iTunes. The musiXmatch lyrics player iPhone, iPod Touch, and iPad app is filled with intuitive tools, features, and navigation for music lovers and shower singers. AppSafari review of musiXmatch lyrics player was written by Jenni Ward on October 22nd, 2013 and categorized under App Store, Free, Fun, iPad apps, Music, Universal. Page viewed 5645 times, 2 so far today. Need help on using these apps? Please read the Help Page.